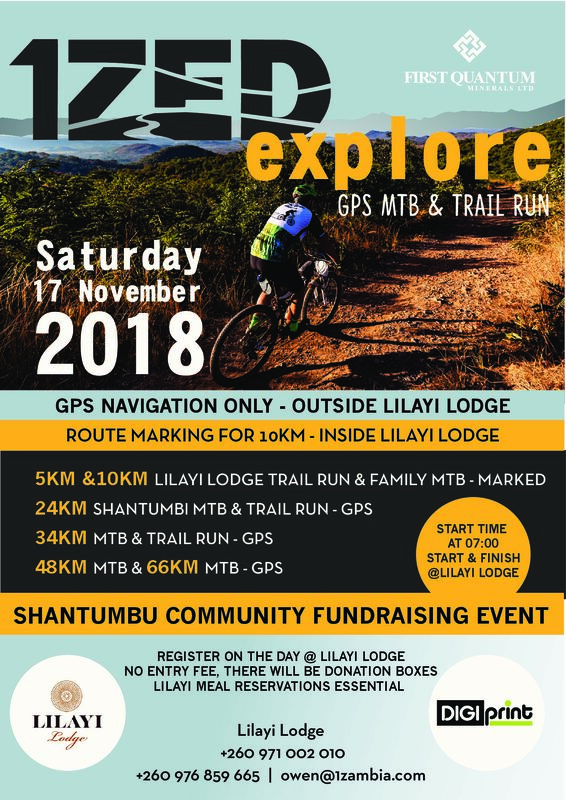 The 1Zed Explore welcomes all levels of runners and mountain bikers and their families to join us at Lilayi Lodge for this special fundraising event in support of the local Shantumbu Community through which many of out favourite trails pass. These communities have always been very welcoming to us. The 1Zed Explore platform now provides us the chance to give back in form of cash donations which will be used to build a community training centre and support a community fish farming project. Also needed are any clothing, toys, books, blankets and/or anything that you feel could be of benefit to the families of this community. We will have big receiving boxes at reception for anything you wish to donate + cash donation boxes. So far we have already repaired a hand pump and installed a trampoline at Shantumbu School, and raised a number of cash pledges for the training centre. Please spread the word and join us for this community fund raising event. Note 1Zed is only providing an adventure and fundraising platform for people to get together, get out and explore through the Lilayi Lodge venue and the GPX files. There is no entry fee, formal registration procedure or prizes. You are free to choose any route you’d like to explore and more importantly you are entirely responsible for your own well being while out on the route. We suggest running / riding with min 2 people in a group. Please book meals and discounted Fri & Sat night room rates direct with Lilayi Lodge. There will be no route marking except for on the shorter distances – GPX files only. Currently no water points, use local hand pumps. Currently no race timing, but the 66km will be considered a race. Please PM Owen Green for further info and if you would like to sponsor in any way and / or volunteer. No entry fee or formal registration, but there will be a donation box.